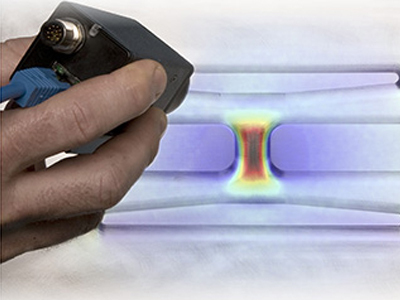 MiTE is a thermoelastic stress analysis capability that exploits recent advances in low-cost microbolometer detector technology to create a highly affordable, rugged, compact and portable means of imaging stress in dynamically loaded structures. See the MiTE flyer for information about hardware requirements and potential applications. See the MiTE Installation & User Guide for instructions on how to install and use the software. Detailed technical information is available in the article Thermoelastic stress analysis with a compact low-cost microbolometer system, by Nik Rajic and David Rowlands. Information on the comparative performance of different cameras is available in the article: A performance comparison between cooled and uncooled infrared detectors for thermoelastic stress analysis by Nik Rajic and Neil Street. Update: 2015 version of MiTE now available for download.